If you have turned on a TV in the last couple of days, mainly ESPN, you probably saw the story about the University of Oregon football team. If you didn’t I will try to break it down here in just a few sentences and post a link as well. Three Oregon football players were taken to the hospital and treated for rhabdomyolysis. This usually happens during high intensity workouts and is not a good thing. It is a syndrome in which soft muscle tissue is broken down with “leakage into the blood stream of muscle contents,” according to the NCAA medical handbook. Rhabdomyolysis is rare, so to see it three times within one workout with the same team should raise many red flags, according to www.oregonlive.com . None of us are perfect, and as coaches we have all made mistakes and have done things that we regret. However, there is something else I want to point out here. This is not an isolated problem. Does the Oregon Strength and Conditioning staff deserve to have criticism thrown their way? Absolutely, but I think they are serving as a scapegoat for many other coaches and trainers who have the same attitude. Just this past August the University of Texas, had eight volleyball players suffer from the same problem. I can’t think of anything else to say here, except that is insane! However, this is even more insane. In 2011 the University of Iowa, sent thirteen athletes to the hospital with similar conditions, and in August 2010, 24 football players from McMinnville High School were hospitalized due to high intensity workouts. All of these reports according to www.oregonlive.com . If you follow high school football, we all know that that there a few times each year where a student dies due to “heat exhaustion.” It often gets reported as the teen was not properly hydrated. The schools try to educate their athletes on proper nutrition and things to wear in the sun. All of this is fine, but here is a better idea. Pay for your coaches to learn. Pay for your coaches to go to clinics and seminars and learn more about what they are doing. I don’t care who you are, how many championships you have won, or where you played at in college, if a 16-year-old kid is hospitalized or worse killed while performing your “conditioning” program that is 100% your fault. Fortunately, in the position I am in I get to work with a lot of youth athletes. One common thing I always seem to hear is “kill em.” This usually comes from a parent and/or a coach. “Kill’em?” Why would I want to do that? If I nearly kill your son or daughter is that going to make them a better athlete? If they go to the hospital, does that make them closer to a college scholarship? If you want your kid to die at the hands of their trainer, you need to find another trainer, I am not your guy. If you judge a training session off how tired your kid/athlete is, or how much they sweat, or if they can walk off the field I am not your guy, and for as nice as it would be to take your money, I will never sacrifice the well-being of a child (or anyone for that matter) and my reputation just so others can have the illusion that the training session was good. Building Character: Performing work until you can’t move builds character. Whatever you must tell yourself to put rationale behind your program. To me character is how you treat others. Character is how you speak to strangers. Character is what you do and the decisions you make while no one is watching. Character is staying true to your spouse. Character is not and never will be about a physical activity. Mental Toughness: Running yourself into the ground builds mental toughness. Not sure how exhausting someone until they can’t move builds mental toughness, but this is made up as well. If you want to build mental toughness take responsibility for your mistakes. Think with a positive attitude. Teach your kid or athletes that winning and receiving a trophy isn’t always going to happen. Teach them that part of being smart is knowing when to slow your training down. Exhaustion doesn’t build mental toughness, life does. How do you react when you lose your job? What do you do when your house burns down and you must start over? You’ve been told you have cancer and must do radiation for six months to beat it, so you rearrange your life just so you can live.That is mental toughness. You learn to be mentally tough by how you react to the bad things life throws at you, not by running suicide sprints in August up and down a football field. 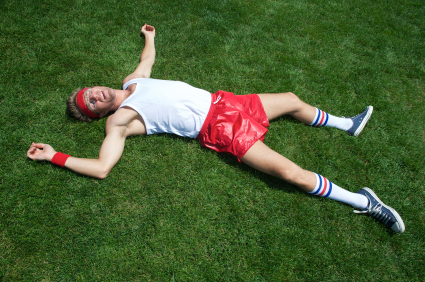 Breeds a Competitive Nature: Doing endless exhaustion drills versus your teammates makes you more competitive. This might be my favorite. So, you think athletes need to do things to be more competitive? I thought that was one of the main reasons they were already athletes, they like to compete. When I read stories about Michael Jordan, Kobe Bryant, Ty Cobb, and other legendary athletes who are said to be the most competitive athletes of all time, I have yet to come across anything that says they learned it from endless competitions at the end of practice.